A good pillow is just as important as a comfortable mattress for getting a quality night’s sleep. However, not all pillows are made to be equal, and you should be careful when selecting the right one for your needs. Online mattress retailer Layla that makes a super unique double-sided bed has recently introduced a new copper-infused pillow filled with a special mix of natural Kapok fibers and memory foam pieces that can perfectly work for most sleeping styles and fit unique comfort needs of most sleepers but will it work for you? The Layla pillow followed the release of the Layla mattress, and it was created to meet the needs of a variety of different sleepers and match the Layla mattress in style, design, and comfort. You can check out our review of the Layla mattress here. What makes this pillow stand out from other pillows is the addition of copper within its cover and the use of Kapok fibers along with shredded memory foam to create a cool, soft and comfortable sleep surface. It is unlike any other pillow available on today’s market and one of the top rated products in the sleep industry. The Layla pillow comes wrapped in a plastic package within its own marked box. This may result in a slight off-gassing smell upon opening the package, but it is nothing overpowering and dissipates within a few hours. It comes in only one standard size which is 18“ x 24“ x 4″, and we found it to be perfect and felt we were resting in the middle of the pillow rather than towards the edge. The pillow is filled with a mix of pieces of responsive memory foam (70%) and Kapok fibers (30%). The foam is CERTIPUR-US® certified, which means it is free from potentially harmful chemicals and toxins, while Kapok fibers come from the seeds of a Kapok tree that is to be found in Central and South America. The fibers naturally serve to help spread the seeds of trees. They are known for their silky feel and can also be woven into fabrics similar to cotton. Furthermore, the fibers are pesticide-free and they are naturally buoyant and hypoallergenic which makes them perfect for those susceptible to different allergies. They make the Layla pillow extremely fluffy and lightweight, but after a few days of sleeping on it a small indentation may stay where the foam and fibers have been pressed down, but it is nothing to worry about. You can fluff it occasionally or throw it in the dryer on a low tumble to help maintain its shape and get it back to its original loft and support. The cover of the Layla pillow is a soft knit blend of polyester, rayon, viscose, and Lycra. It contains copper-infused fibers that don’t just create a cool sleeping surface and add antimicrobial protection to the pillow but are known to reduce inflammation and snoring and influence positively on blood circulation as well. The cover is thick, durable, plush, easy to be cleaned, and it can almost serve as a stand-alone protection if you don’t want to use a separate pillowcase although the company recommends using the pillowcase. The edges of the cover are double stitched and folded in which contributes to a seamless look of the case and helps hold the redistribution of the filling well when under pressure, or when being shaped for comfort purposes. 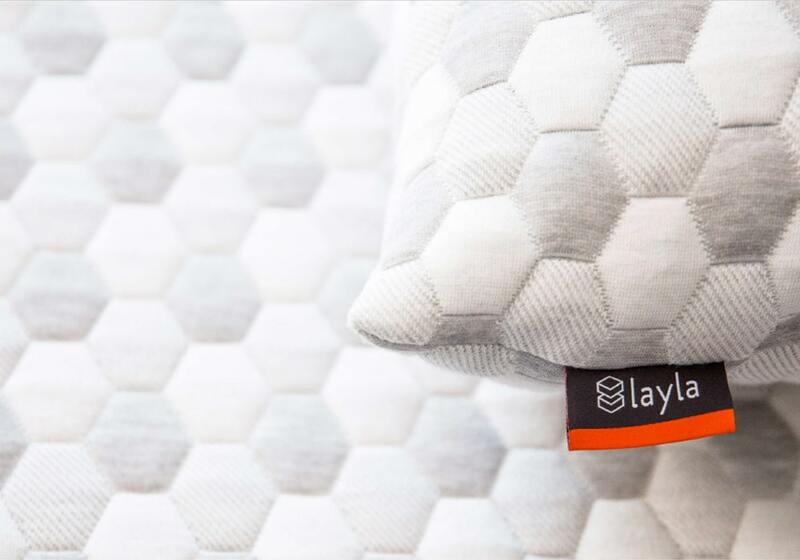 As I have already mentioned, the Layla pillow is made of 70% memory foam pieces and 30% Kapok fibers. This provides more of a memory foam pillow feel over a Kapok-fiber pillow, but it stays lightweight due to the mix of shredded pieces of foam and Kapok fibers. It creates the feeling similar to overstuffed feather and down pillow with a thicker and slightly more firm underlying support. The foam and Kapok combination of this pillow provides a very soft and fine feeling. It creates the down like feel and has all the conforming and pressure relieving benefits of memory foam. It provides excellent support and a soft contouring typical for Kapok. For us, this pillow is one of the most comfortable pillows available on today’s market. It is a perfect blend of softness and support. It is one of our favorite pillows and what Andrew and I really like about it is that it has this memory foam feel and support while it allows us to move the fill around, depending on what position we sleep in. So, although it is not adjustable (you can’t open the pillow and remove the filling to reach the desired amount), you can manipulate the filling to create the feel and support you need. It also sleeps cooler than many other pillows we have tried out to date due to its breathable construction and copper-infused cover. The use of the best Kapok fibers and shredded foam allow a good airflow through the pillow, while the copper in the cover prevents heat retention and creates a cool and comfortable sleep surface necessary for a deep and sound sleep. The Layla pillow is more on a loft side and it better suits back and side sleepers than stomach sleepers. When lying on my stomach I didn’t initially find it to be uncomfortable as it compressed pretty well, but I soon felt the need to turn on my side. As I’ve already mentioned, it is more on a loft side, and unless you are a wide shouldered sleeper, this pillow may not hold your head in level with the rest of your back. When lying on my back and side, however, it cradled my head and perfectly contoured my neck filling the space under it. It didn’t take long and it lulled me into sleep. The Layla pillow may not be ideal for stomach sleepers, but it has enough give and support needed to provide a comfortable sleep when lying on your back or side. The Layla pillow costs only $99 which is an extremely reasonable price given the overall quality and luxuriousness of this pillow. You can purchase it through the Layla website. Shipping is free, and it will arrive about a week after ordering. 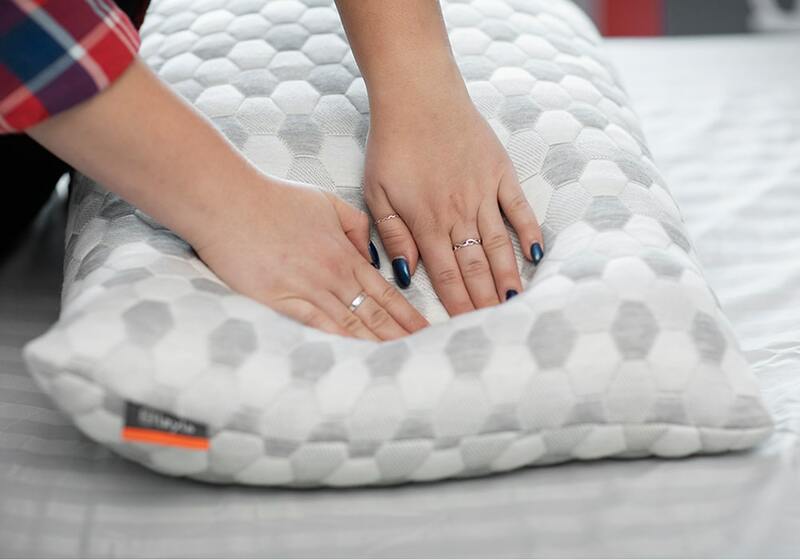 Layla offers 120-night sleep trial and 5-year warranty on this pillow, and it is a risk-free investment that can be returned for a full return. Click here to get the best price on the Layla pillow. Is the Layla Pillow right for you? Back and side sleeping – The combination of the highest quality pieces of memory foam and soft Kapok fibers makes this pillow quite lofty which may not suit the people who tend to seep on their stomachs, but as such it is perfect for side and back sleepers. It is fluffy and soft with slightly firmer underlying support, and it fills the space under your neck and provides perfect contouring to your head and neck. Cool-sleeping pillows – The Layla pillow does not sleep warm at all despite its thickness and luxuriousness. The shredded memory foam and silky Kapok fibers make this pillow breathable, while the copper woven into its cover creates a cool sleeping surface and prevents the retention of heat. A pillow with many health benefits – The Layla pillow has many health benefits. As it has been already mentioned, this pillow is partly made of the hypoallergenic Kapok fibers which suit those suffering from different allergies. The copper-infused fibers in its cover help regulate blood circulation, reduce snoring and inflammation, and keep your skin clean. In general, our experience with the Layla pillow was more than positive. The unique mix of the all-natural Kapok fibers and shredded memory foam provides necessary contouring support, while at the same time it has the softness where it is needed to create a truly comfortable sleeping surface. It is an ideal fit for both side and back sleepers, but it may be too thick for most stomach sleepers. The Layla pillow has an extremely soft cover with copper fibers woven into it and the filling that can be manipulated to meet most needs. It is a durable and long-lasting product, washable and dryable if needed and it comes with a 120 sleep trial and free shipping which makes this pillow a risk free investment and unlike any other sleep product present on today’s market.